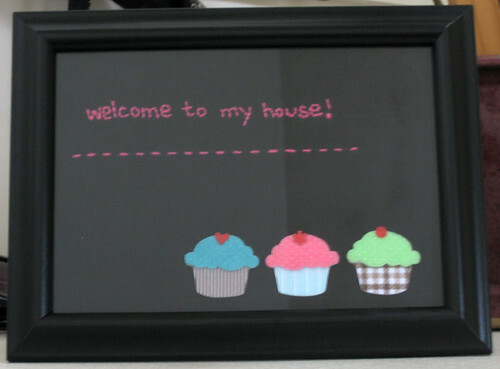 Miso Crafty Knits: Welcome to my house! My very first project of the year completed!! Inspired by a similar project that I saw in the current Cotton Time magazine, I thought it would be a real cute way of welcoming guests to my new home. I bought the frame at Walmart, the Cotton Time version featured a simple unpainted wooden frame. I thought since I wasn't going to be using linen that my version wouldn't need such a natural looking frame. I used black Kona cotton from my stash, and hot pink embroidery thread for the words and running stitch. The original idea had 3 apple appliques with embroidered stems and leaves. That idea really wasn't "me", but was going to follow suit anyways, using hot pink fabric for the apples. That is, until I saw these cupcake stickers from the Martha Stewart crafts line. Bingo! All the embroidery work looks cute. But the picture is a little too blurry.